If you’re looking for new flooring for your home, you may want to consider taking a look at luxury vinyl flooring. Luxury vinyl is becoming a popular alternative to hardwood and stone flooring. At Washington’s Carpet One Floor & Home we stay on top of the latest flooring trends and carry the best brands and products so you can confidently shop with us. Luxury vinyl offers many features and benefits that’ll not only make your life easier but also make your home more functional. Luxury vinyl is softer and warmer underfoot than hardwood or stone, and also offer noise reducing qualities. In addition, you can achieve the same natural beautiful looks as hardwood or stone. Luxury vinyl comes in planks and tiles that can mimic the exact look of other natural flooring options. Luxury vinyl is fast and easy to install, giving you back time to enjoy your new floors. They are also incredibly durable and simple to clean, meaning you have more time to do the things you want instead of worrying about your floors. Since luxury vinyl is such a rapidly growing flooring category, there are different types of luxury vinyl you can choose from including vinyl tile flooring and vinyl plank flooring. Vinyl tile is an alternative to ceramic and porcelain tile, while vinyl plank is an alternative to hardwood and laminate. There are also other types of luxury vinyl including WPC, SPC, and rigid core options. We are often asked if all luxury vinyl flooring is waterproof. For the most part, a lot of luxury vinyl options come with some level of moisture resistance. There are options though that are made to be 100% waterproof. Those options can include super durable luxury vinyl like Invincible H2O, or they could be WPC luxury vinyl. WPC luxury vinyl has a strong waterproof core that prevents the planks or tile from expanding or contracting when exposed to moisture. This stops moisture from reaching your subfloor. Always remember though that just because your floors are waterproof, your subfloor is not, so make sure you clean up large spills as soon as you can. Luxury vinyl is fast and easy to install, giving you back time to enjoy your new floors. They are also incredibly durable and simple to clean, meaning you have more time to do the things you want instead of worrying about your floors. Luxury vinyl is suitable for pretty much any area in the home. It can withstand the foot traffic you typically see in living rooms, it is comfortable enough for bedrooms, and it can handle the moisture you’d expect in kitchens. In high-traffic or high-moisture areas like bathrooms, however, we do recommend choosing a waterproof luxury vinyl floor. Washington’s Carpet One Floor & Home is your local leader when it comes to luxury vinyl flooring. Be sure to visit our showroom to learn everything there is to know about luxury vinyl. Our featured luxury vinyl flooring brands are Invincible™ H2O and VERÓSTONE™, all of which are Carpet One Floor & Home exclusives. We carry name brand and Carpet One exclusive brands for luxury vinyl products. Shop with us confidently knowing you’re looking at the best selection. Luxury vinyl has the ability to look and feel exactly like a real hardwood floor. Get all the benefits of vinyl but with the beautiful natural look of hardwood. Learn about the installation process for luxury vinyl flooring. 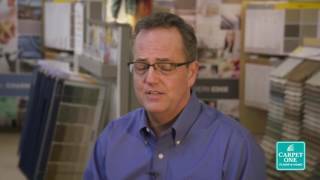 Learn about sheet vinyl, WPC, and rigid core.